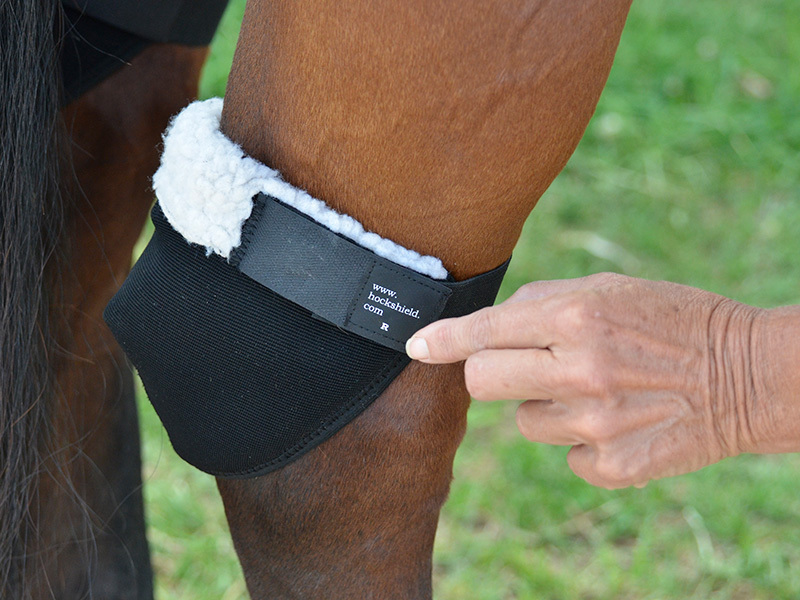 The low profile design offers full coverage in the area where horses develop sores. 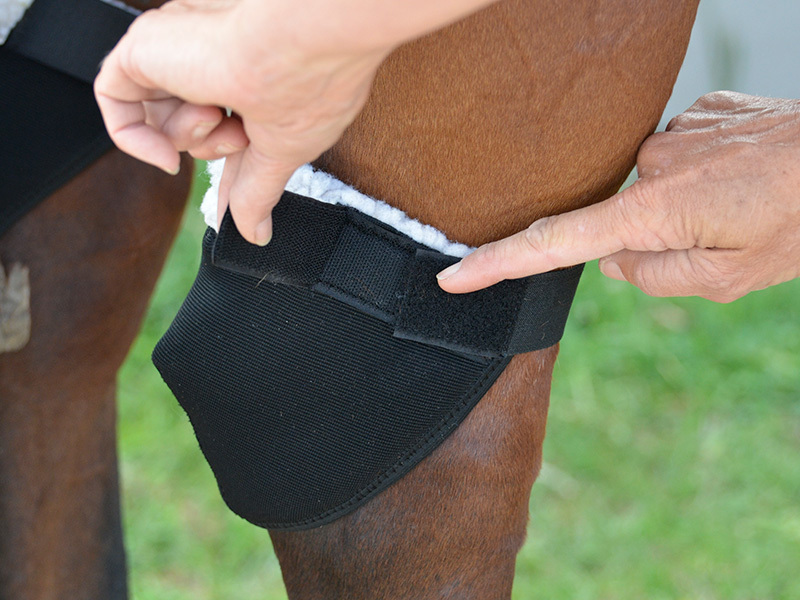 The soft, flexible pocket in the center back of the Hock Shield provides comfort in the delicate area where the tendons pass just under the skin. 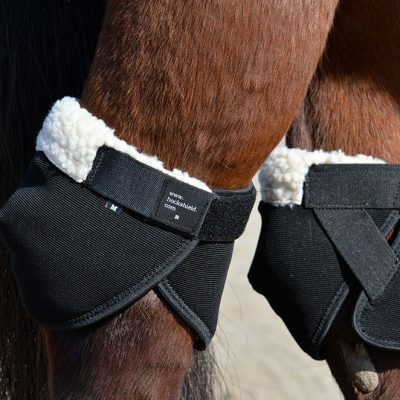 This is the perfect solution for the majority of horses with hock sores. Now available in two adjustable sizes. Can be worn 24 hours/7 days a week. Plan on replacing your Hock Shields after about 3 months of full-time wear. However, some horses have been known to wear their Hock Shields for 6-12 months. Because some products can burn skin when wrapped, please consult veterinarian when using medications under our Shields. 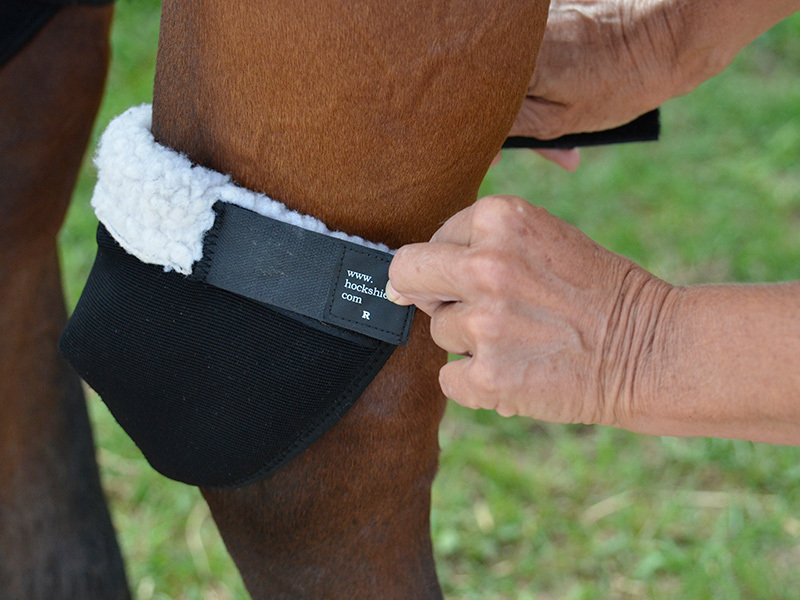 Not to be used on horses in turn-out or on pasture. 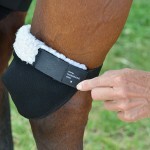 It is not advisable to restrict the leg when your horse is in a full gallop. Note:Some horses may grow white hairs on back of leg where top band rubs. 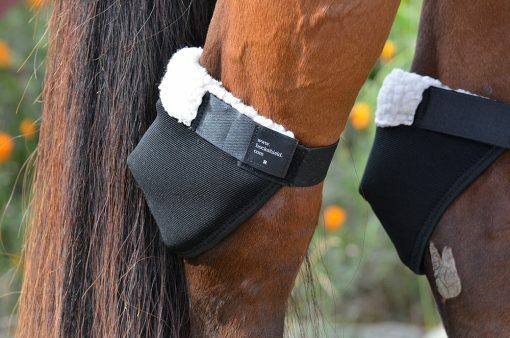 If your horse has neoprene sensitivity, do not use these products. 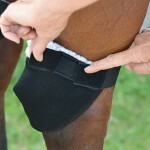 Measure the smallest point just above the hock joint. Make sure the leg is straight and the hoof is flat on the ground. 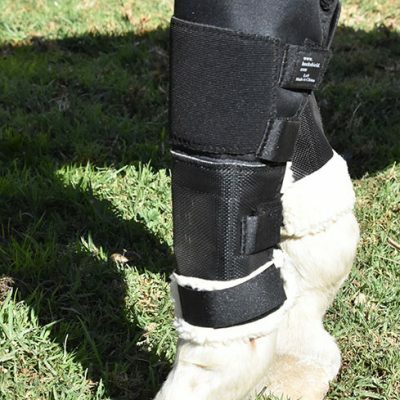 Make sure the leg is straight under and the hoof is flat on the ground. Put the side with the label on the outside of the leg. 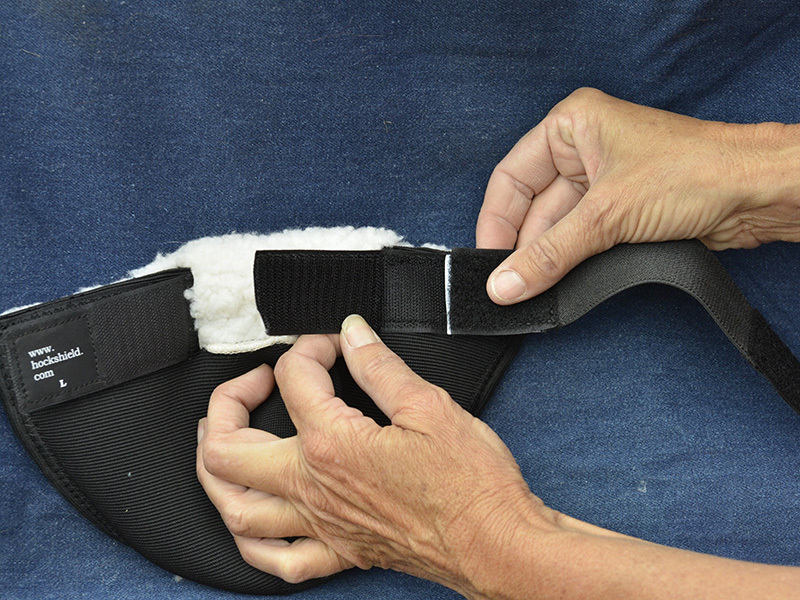 Bring the elastic strap around the inside of leg to the outside. Pull the strap for a “snug” fit. Lock top Velcro flap down. Adjust inside tab ONLY if outside tab is too long or too short. You should be able to put two fingers between the horse’s leg and the band. 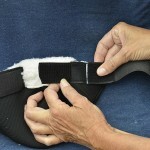 DO NOT pull the elastic strap too tight so as to restrict circulation or create pressure sores. It is better to go too loose than too tight. With a little experimentation, you will find the perfect fit. 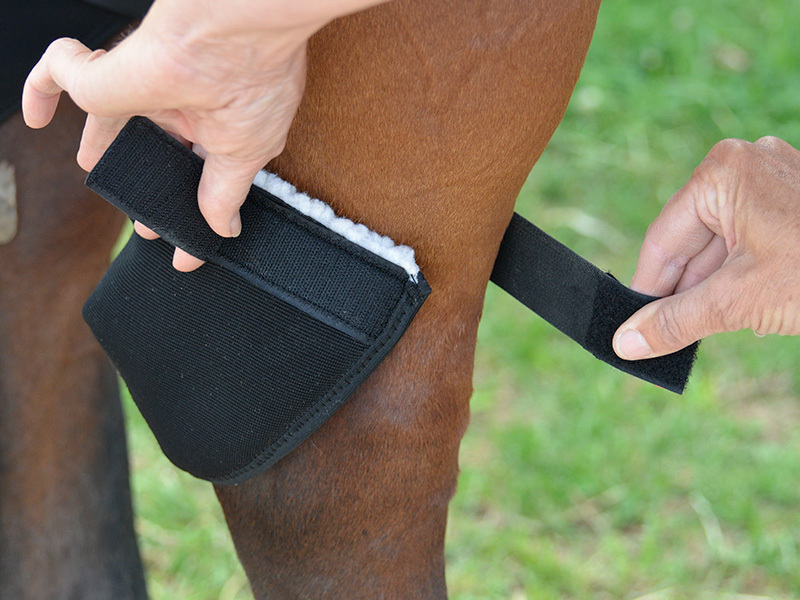 Because some medicines can burn the skin when wrapped, consult veterinarian when using medications under the Hock Shield.